What are the factors that cause dropping wireless connection? reset the device. To learn how, click here. reconfigure its settings. To learn how, click here. upgrade the firmware to fix connectivity issues. To learn how, click here. The location where your wireless router and computer are placed affects the performance of your wireless network. To boost the wireless signal, it is ideal to place the wireless router either in the central part of your house or in a location free from any obstructions that may block its range. 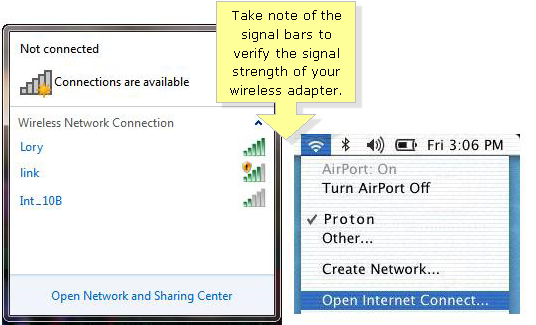 Check the signal strength received by your wireless adapter or AirPort® for Mac® users. If you’re using a Windows computer, the signal strength indicator comes with the wireless network name or Service Set Identifier (SSID) upon connecting. The recommended signal strength should be closest to full bars to have the best connection possible. The Maximum Transmission Unit (MTU) specifies the largest packet size permitted for Internet transmission. Determining the proper MTU size is important in order to get the most efficient throughput for the network. To know how to determine and set up the correct MTU size of your network, click here. The frequency used by your router’s wireless network can be set to 2.4 GHz, 5 GHz, or Mixed. Interference happens if there is conflict with some wireless devices that are also using the same frequency within your network. The most common examples of devices that use the same frequency are cordless phones, microwave ovens, and baby monitors. Another factor that could cause interference would be a separate wireless network which operates in the same frequency as your router’s. To resolve frequency interference issues, power OFF the device that could possibly cause the interference or relocate your router away from it. Another solution is to change the current wireless network channel which is set in your router’s settings. For instructions on how to do this, click here. QUICK TIP: In changing the wireless network channel of your Wireless-N Dual Band router, it is best to leave the channel width at Auto. This will automatically adjust the settings to 20 or 40 MHz, depending on which best fits your network. It would be best if the router is within the line of sight of the computer. This will ensure a stable wireless connection between the devices. The lesser the walls between the computer and the router are, the stronger and more stable the connection would be. To know more about getting poor or no signal on a wireless router due to physical obstructions and interference, click here. For best results, Wireless-N routers should be paired with Wireless-N adapters in the same way that Wireless-G routers should be paired with Wireless-G adapters. Should there be a mix of Wireless-G and Wireless-N adapters connecting to the network, it would be best to set the wireless network mode to Mixed. This will allow Wireless-G devices to have a stable connection to the network and will allow the Wireless-N device to still connect to the network but will be performing based on the Wireless-G speed. NOTE: To learn more about differentiating wireless frequency bands, click here. You should have an updated driver installed for your adapter for better connectivity. For instructions on how to update your Linksys wireless adapter, click here. If you are using a different wireless adapter, refer to your manufacturer’s documentation for further assistance. Sudden power interruptions may result to having intermittent wireless connection or even having none at all as soon as you are able to recover from the outage. If this happens, a recommended workaround would be to powercycle your router. To do this, power OFF your device and unplug it from the power adapter. Wait for 10 seconds before plugging it back in and turning it ON.